The environmental health of the Baltic Sea is not sufficient, and does not meet the objectives of the Baltic Sea Action Plan. 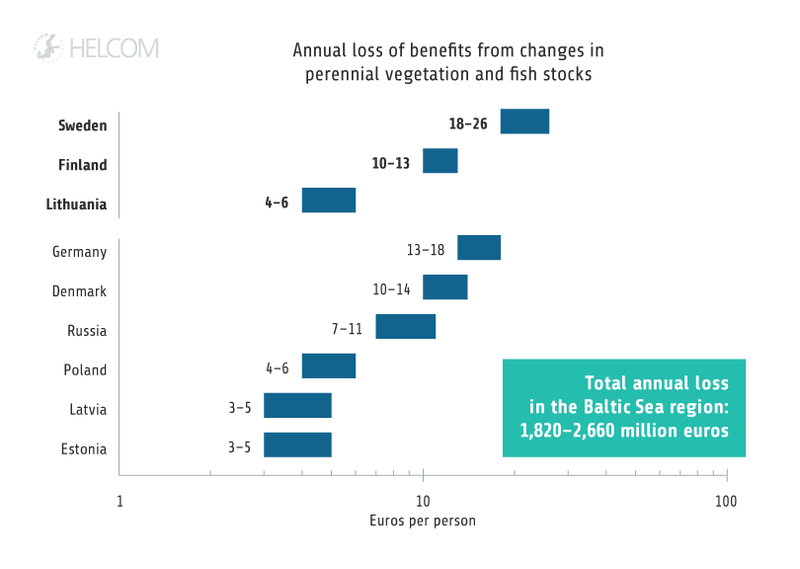 However, this report clearly shows that the measures taken so far, such as cutting nutrient inputs and pollution and working to protect biodiversity, have made a difference to the state of the Baltic Sea environment. There are many challenges for the future work of HELCOM. Together with new actions, the current measures are expected to show further results over time. 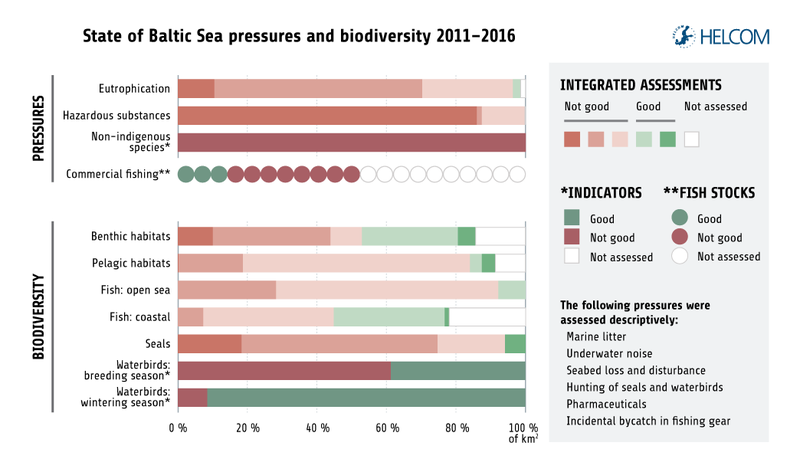 The results show that, although signs of improvement in the state of the Baltic Sea are seen in some cases, the Baltic Sea Action Plan goals and ecological objectives have not yet been reached (Figures ES1-ES2). 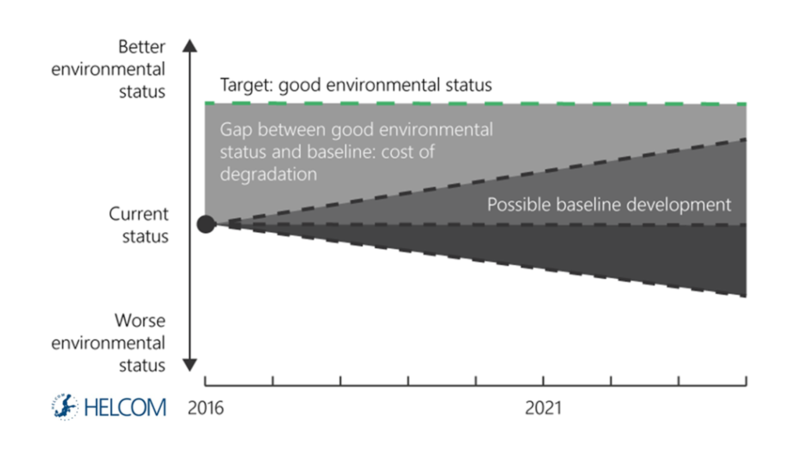 Further development of actions to improve environmental status is of high relevance, and already agreed actions are to be implemented or continued. In addition, it is noted that some measures already put into operation have not yet been in place long enough to have an effect. For measures such as the reduction of nutrient loads it will take several decades before the full effects can be measured in the environment. 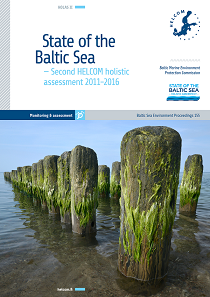 The assessment provides key information for taking further steps to reach good environmental status for the Baltic Sea and strengthen the implementation of the HELCOM Baltic Sea Action Plan by 2021. The assessment may also serve as a regional baseline for implementing the UN Sustainable Development Goals as well as serve the purposes of the EU Marine Strategy Framework Directive for those countries around the Baltic Sea that are EU Member States. Figure ES1. Summary of the assessment of pressures and status for the Baltic Sea showing the proportion of area covered by different assessment status categories (based on square kilometres). For commercial fishing, the summary shows status of fish stocks. 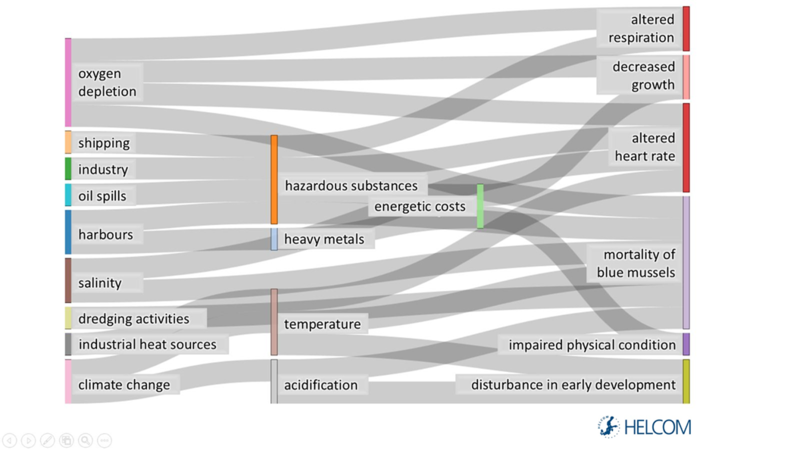 Integrated assessment results (eutrophication, hazardous substances, benthic habitats, pelagic habitats, fish, and seals) are shown in five categories. Assessment results based on indicators (commercial fishing, non-indigenous species, and waterbirds) are shown in two status categories. Figure ES2. Summary of the assessment of pressures and status by sub-basins the Baltic Sea. For each sub-basin, each petal refers to a pressure or biodiversity ecosystem component according to its position in the flower shape, as shown in the figure legend. White petals are shown when no assessment is available, or when the assessment is currently incomplete. For marine litter, underwater sound, and seabed loss and disturbance, descriptive information provided in the report. 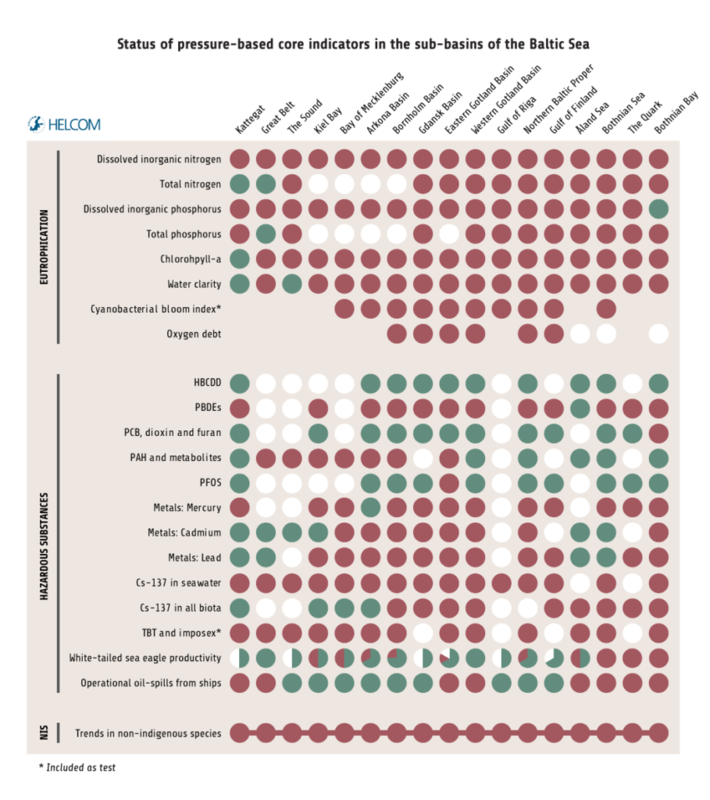 Integrated assessment results are shown in five categories for eutrophication, hazardous substances, benthic habitats, pelagic habitats, open sea fish, and seals. Waterbirds are not assessed at integrated level (see Figure ES4 in the Summary of findings for indicator results). 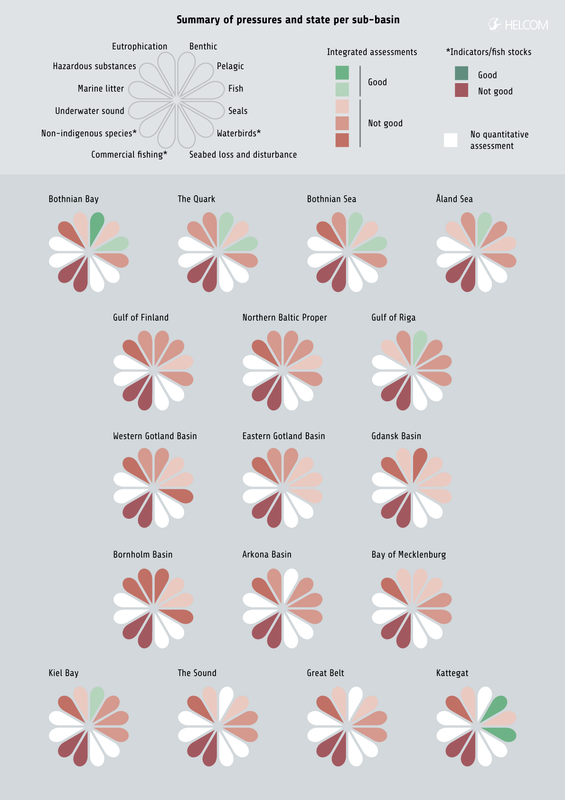 For commercial fishing, the petal colours correspond to the status of the fish stock in the worst status in that sub-basin. 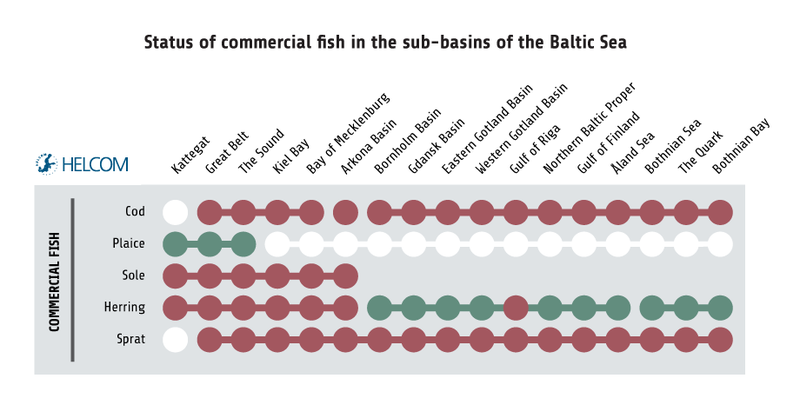 Non-indigenous species are assessed at the Baltic Sea scale, and the same indicator result is shown for all sub-basins. An overview of all assessment results by indicators and sub-basins, including results for waterbirds in coastal areas, is shown in Figures ES3-4 in the Summary of findings. 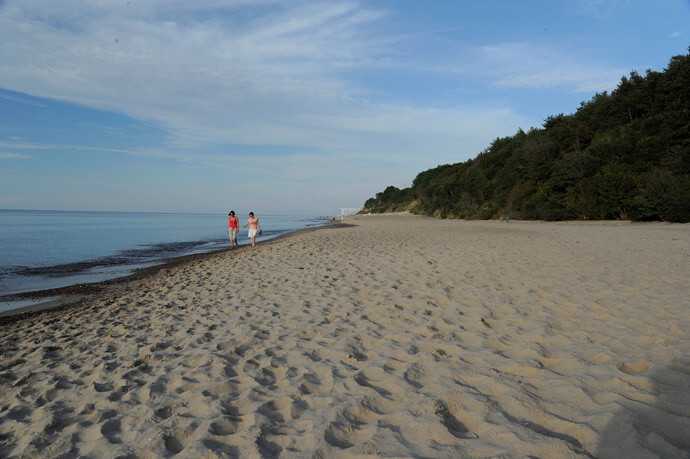 The Baltic Sea is one of the world’s largest brackish water areas. It is inhabited by both marine and freshwater species, but the number of species is low compared to most other seas due to the low salinity. The drainage area is inhabited by around 85 million people, who influence the status of the Baltic Sea via human activities on land and sea. 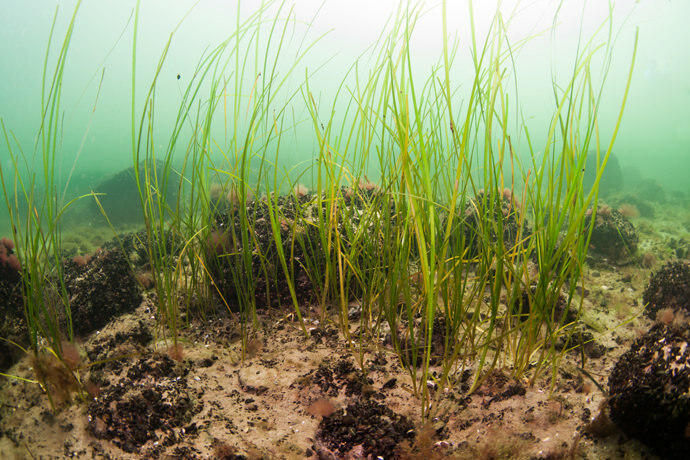 Due to the limited level of water exchange, nutrients and other substances from the drainage area accumulate in the Baltic Sea and are only slowly diluted. The status of seven distinct pressures on the Baltic Sea are assessed in this report (Figure ES3). In addition, a particular concern for the Baltic Sea is the wide and increasing distribution of areas with poor oxygen conditions in the deep water. 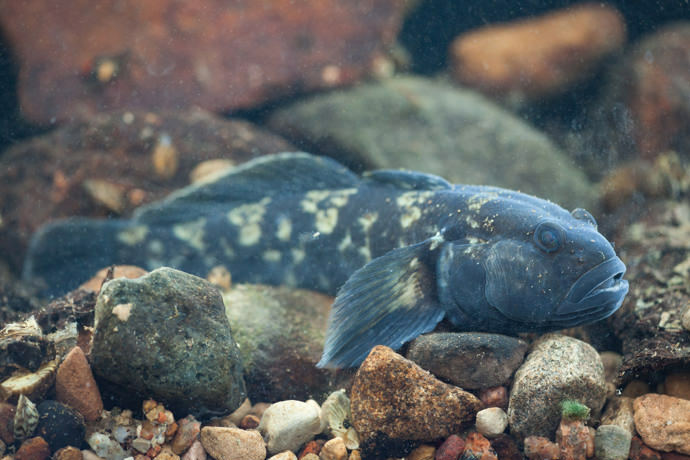 Climate-related increases in water temperature and decreases in salinity are further expected to affect the distribution of species over time, as well as their physiology and food availability. 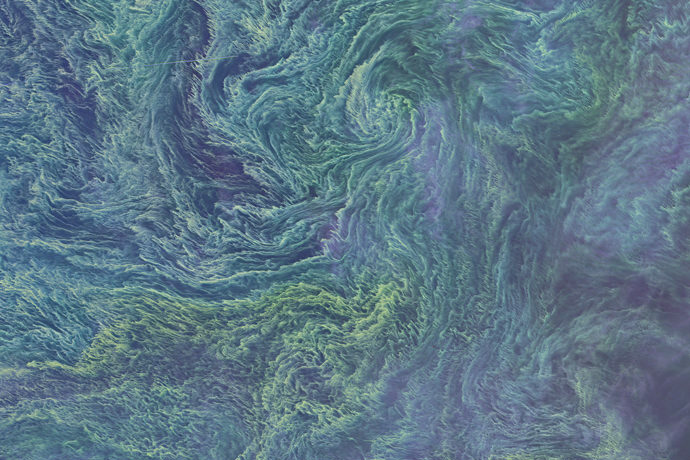 Eutrophication has been evident in the Baltic Sea for many decades, due to past high and still excessive inputs of nitrogen and phosphorus. 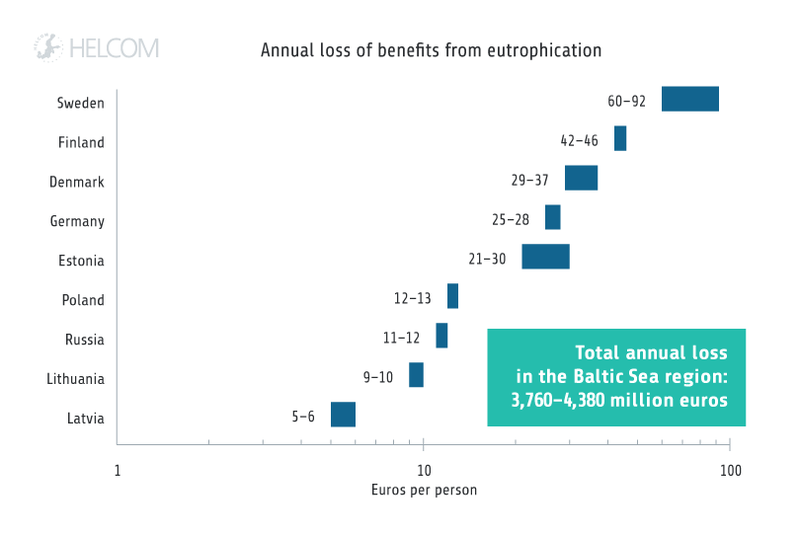 Ninety-seven percent of the Baltic Sea area is affected by eutrophication and twelve percent is assessed as being in the worst status category. 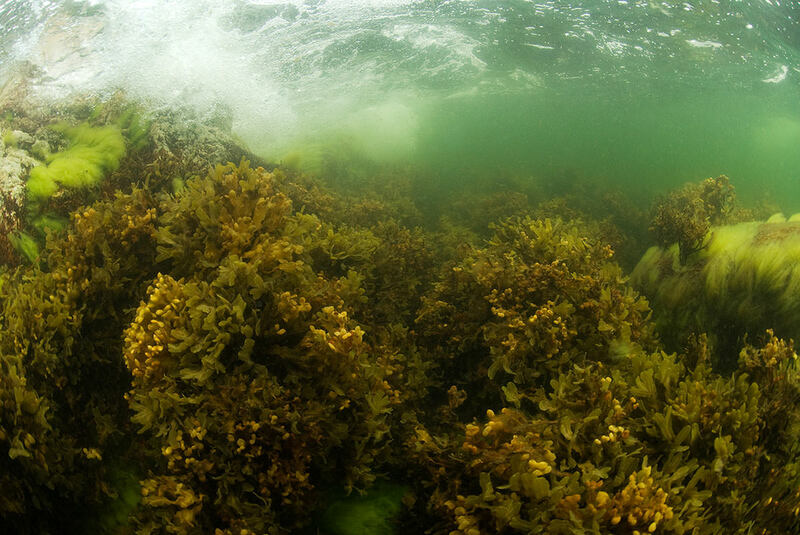 Inputs of nutrients from land have decreased, but the effect of these measures are not yet generally reflected in the status of the marine environment. The eutrophication status has deteriorated in four out of the seventeen open sea assessment units since the last five year period (2007–2011), and improved in one. Only a few coastal areas are currently unaffected by eutrophication, but an improving trend is seen in some indicators and sub-basins. Levels of contaminants are elevated and continue to give cause for concern. However, the number of improving trends outweighs the number of deteriorating trends in the monitored hazardous substances. The integrated contamination status is mainly influenced by polybrominated flame retardants and mercury, together with Cesium (Cs-137), deposited after the accident at the Chernobyl nuclear power plant in 1986. 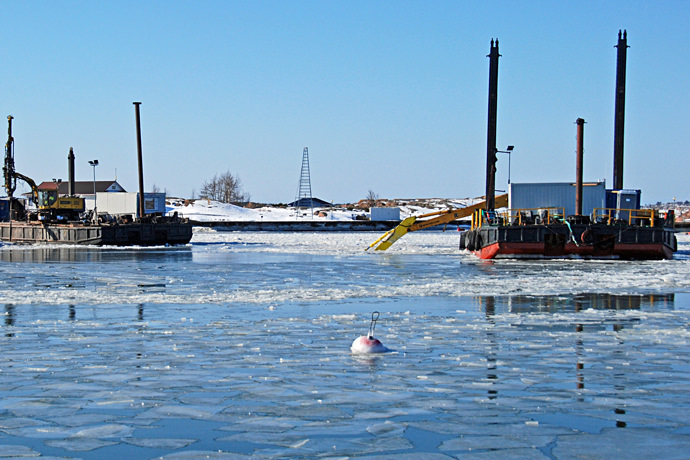 Levels of radionuclides are now at acceptable levels in some sub-basins and can be expected to be so in all of the Baltic Sea by 2020. 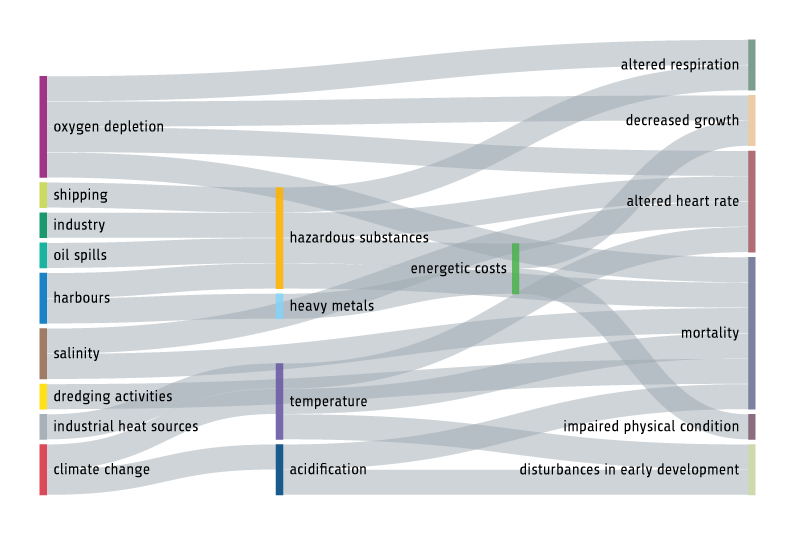 Acute pollution events from oils spills have decreased. 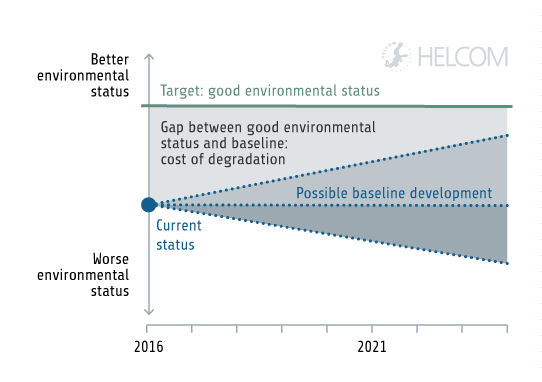 HELCOM is developing core indicators for assessing marine litter, but they are not yet operational and thus no assessment of status has been possible at this time. Beach litter monitoring is ongoing in several countries, showing that the number of beach litter items ranges from around 50 on reference beaches to up to 300 in urban beaches, per 100 metres of shoreline. Plastic litter is a special concern due to its risk to the environment and its slow rate of degradation. 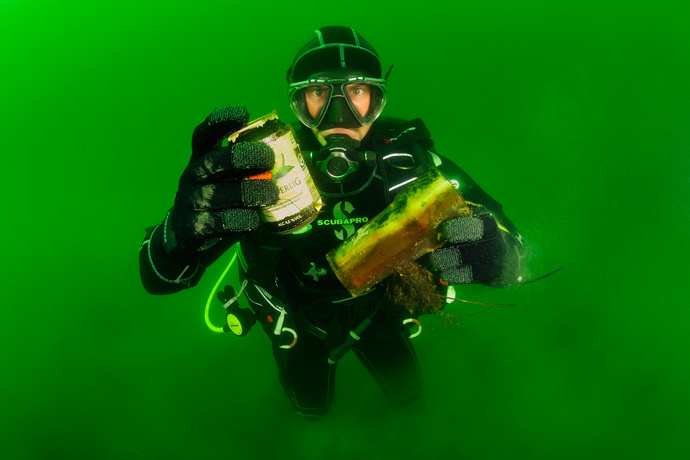 Around 70 % of the litter items in the Baltic Sea are derived from plastic materials. 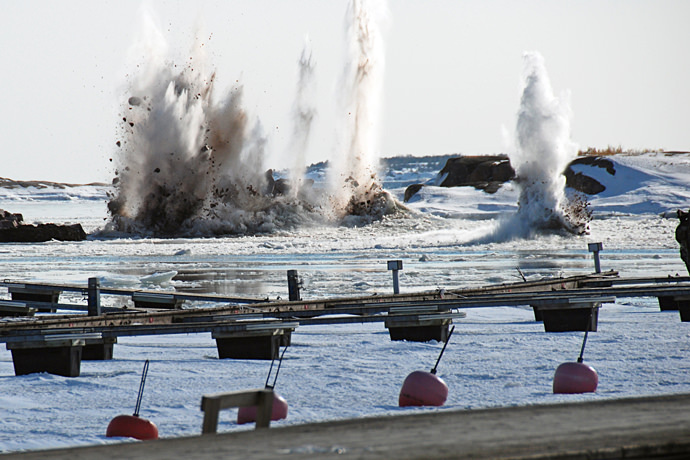 Underwater sound is a widely distributed pressure in the Baltic Sea, caused by various human activities. Areas with high levels of continuous sound mainly coincide with areas of high vessel traffic. Up to 1,700 impulsive sound events were registered in 2011-2016. The majority of these stem from explosions, whilst around eleven percent are linked to pile driving in connection to construction work. It is not known how many marine species are impacted by underwater sound, and thus no assessment of status has been possible at this time. 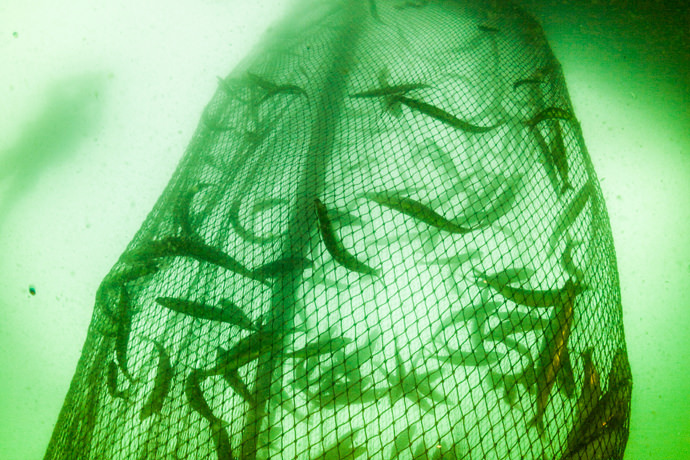 Around 140 non-indigenous species have so far been recorded in the Baltic Sea. 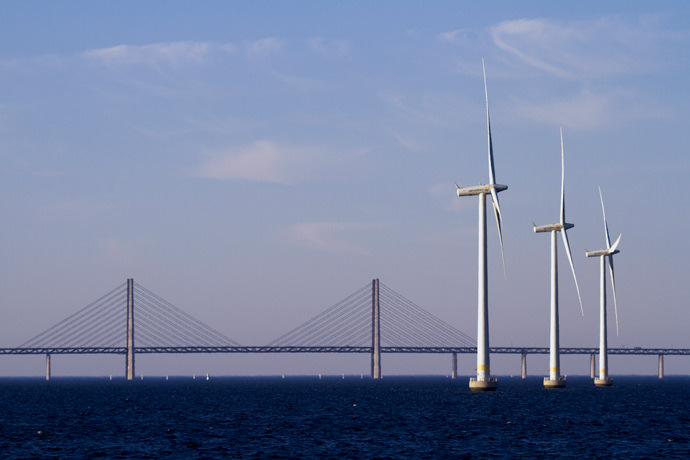 Of these, 12 are new for the Baltic Sea during 2011–2016. 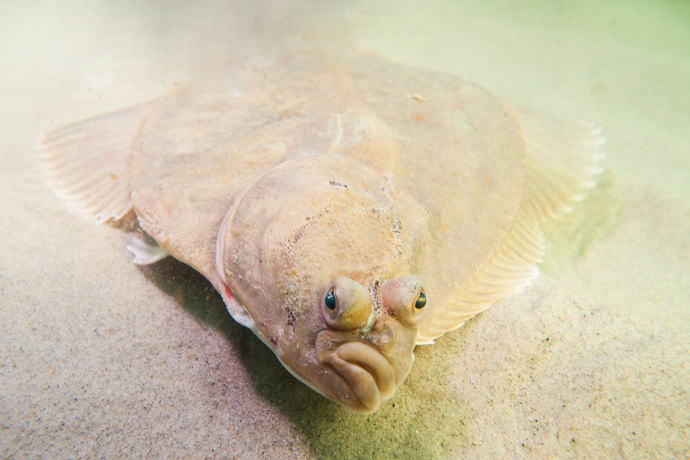 In addition, an unknown number of previously arrived non-indigenous species have expanded their distribution range to new sub-basins in the Baltic Sea. The regional objective is that there should be no primary introductions of non-indigenous species due to human activities during an assessment period and thus, good status is not achieved. Three out of nine assessed commercial fish stocks are in good status with respect to both biomass and fishing mortality rates. Eight stocks are currently lacking an evaluation with respect to both of these aspects. Hunting of marine mammals and birds is minor. Seals are generally protected, but hunting is permitted in some countries, restricted to populations above a limit reference level and with a positive growth rate. 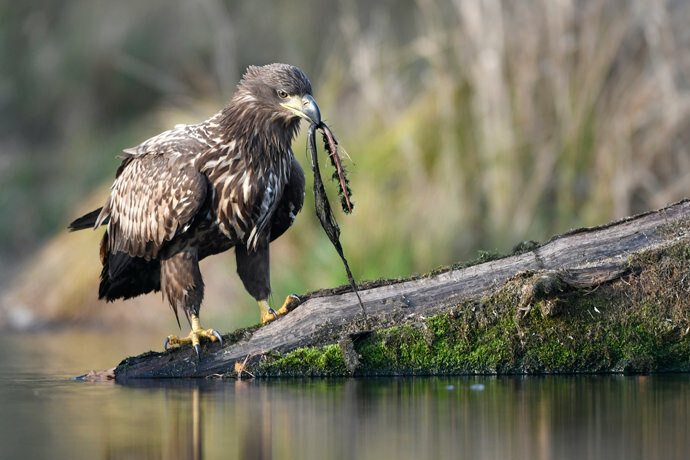 Waterbirds are hunted in some countries, whereas in others they have strict protection. 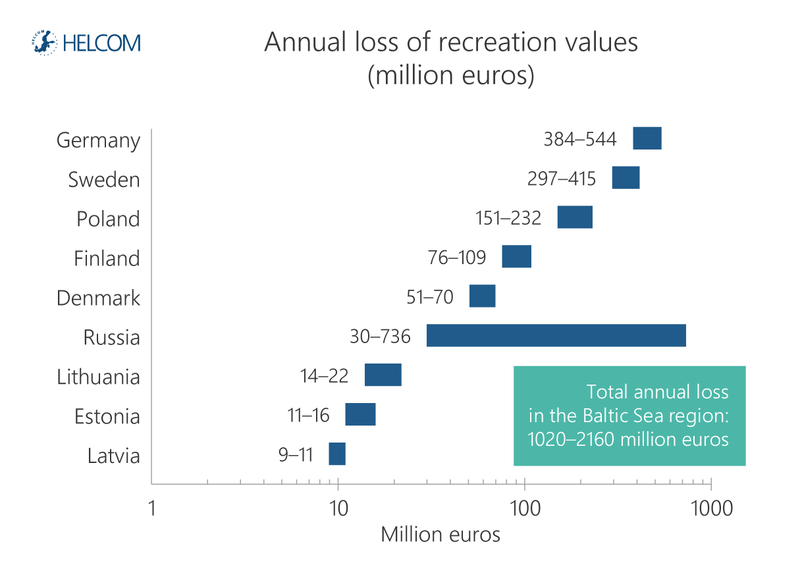 Less than one percent of the Baltic Sea seabed was estimated as potentially lost due to human activities, while roughly 40 % of the Baltic Sea seabed was estimated as potentially disturbed during the assessment period. The estimates are based on the spatial extent of human activities but have not been linked to pressure intensity. Hence, no assessment of adverse effects on the seabed has been made at this time. Figure ES3. Status of pressure-based core indicators for eutrophication, hazardous substances and non-indigenous species by sub-basin. Green circles indicate good status, red circles indicate not good status, and white circles indicate that the core indicator is applicable or relevant to the sub-basin, but has not been assessed. Empty points indicate that the indicator is not applicable or relevant. For coastal indicators, pie charts show proportion of coastal assessment units per sub-basin in good status (green), not good status (red) and not assessed (empty). 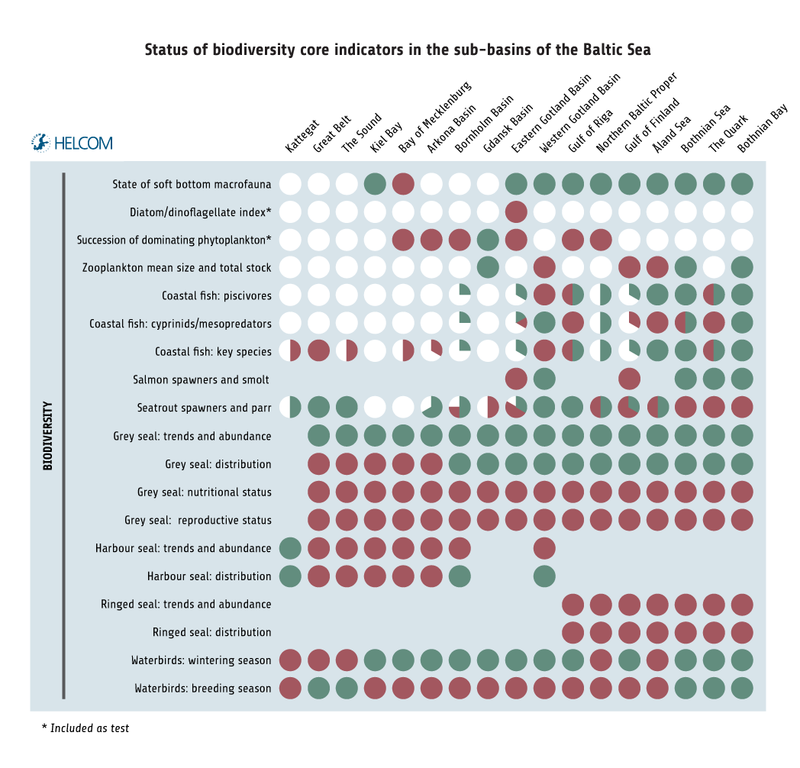 For the biodiversity core indicators there are cases of inadequate status in all levels of the food web; only a few core indicators have acceptable levels in part of the Baltic Sea, and none of them in all assessed areas. The results for different indicators are not directly comparable, as their assessment methods have been developed independently. However, the overall results suggest that the environmental impact on species in the Baltic Sea are far-reaching and not restricted to certain geographic areas or certain parts of the food web (Figure ES4-5). For benthic habitats, there is indication of good status in six of thirteen assessed open sea areas, based on estimates limited to soft bottom habitats. Coastal areas show good status in about one third of the assessed Baltic Sea region. Pelagic habitats are assessed based on core indicators representing primary productivity, and in some sub-basins also zooplankton. Based on the available indicators, open-sea pelagic habitats achieve good status only in the Kattegat. Coastal pelagic habitats show good integrated status in about one fifth of the assessed areas. The assessments of habitats are still under development and additional elements will be included in the future. The assessment of fish from a biodiversity perspective indicates good status in about half of the assessed coastal areas. In the open sea, good status is achieved only in the Bothnian Bay. Two out of five assessed pelagic fish stocks (herring in the central Baltic Sea and the Gulf of Bothnia) have good status, and one of four assessed demersal stocks (plaice). 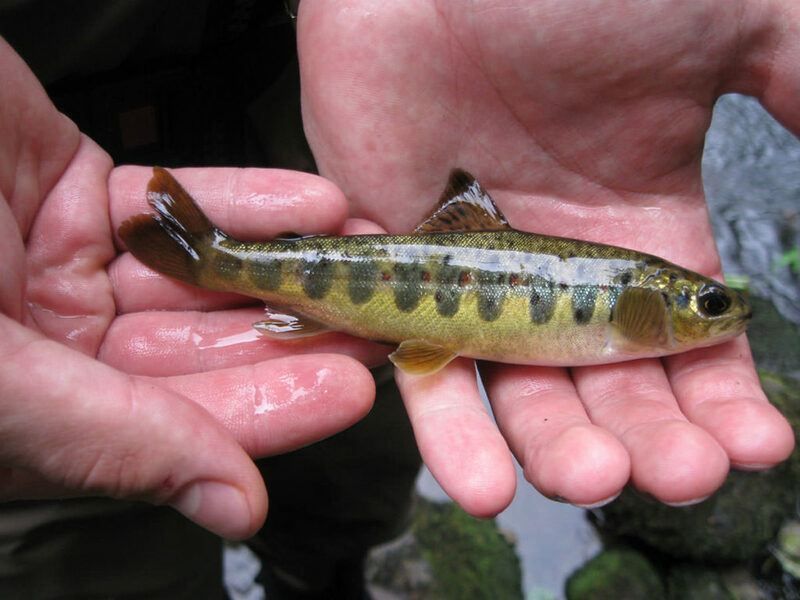 Core indicators for the migratory species salmon and sea trout show mixed results with strong geographical differences. Eel is critically endangered. Among the marine mammals, grey seals and harbour seals show increasing population sizes. Of the three management units of harbour seals in the HELCOM area, only the Kattegat population shows good status. 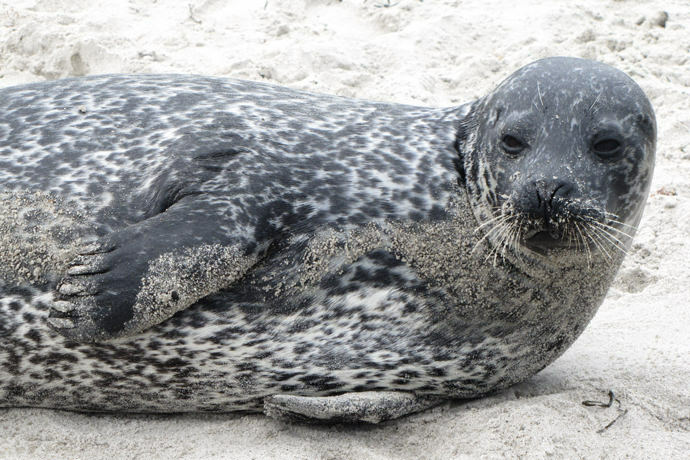 The population of ringed seal in the Gulf of Finland is in critical state. The population is sensitive to climate change, and is decreasing, currently represented by around 100 animals. A particular concern is the Baltic Proper population of harbour porpoise, with a population size recently estimated at around 500 animals. The Kattegat-Belt-Sea-Western Baltic subpopulation was also assessed by HELCOM as threatened, albeit with a lower threat status “vulnerable” and the sub-population is stable. 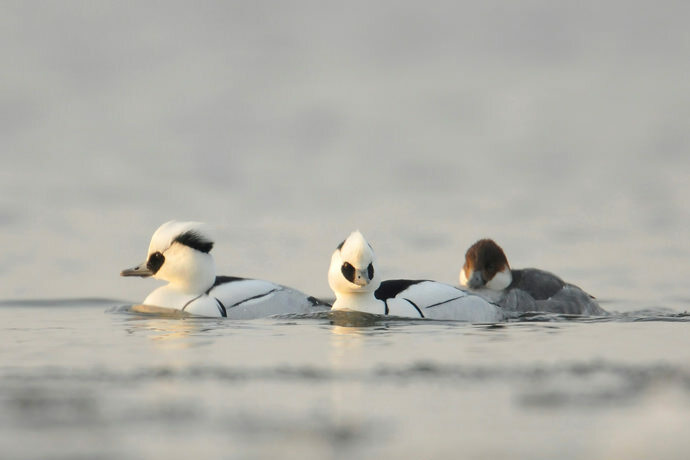 Waterbirds are assessed based on the abundance of species during the breeding and the wintering seasons, respectively, focusing on coastal areas. The results suggest good status at Baltic Sea scale for both waterbird indicators, although more differentiated results are evident at the finer geographic scale. Waterbirds in open sea areas were not included in the indicators. 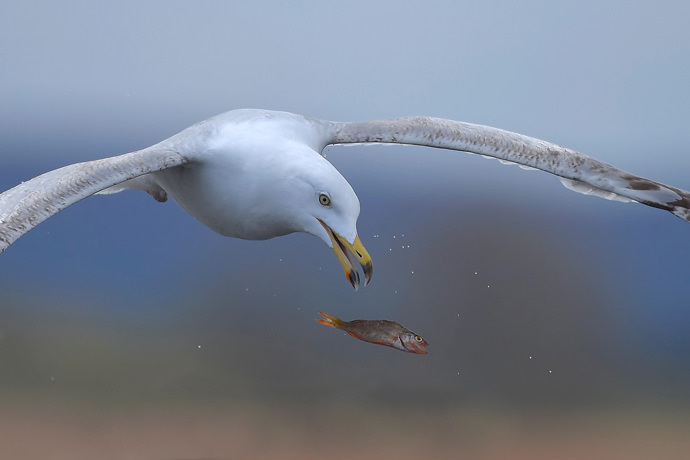 Many bird species in open sea areas show strong Baltic-wide declines. An overall assessment of birds was not possible. 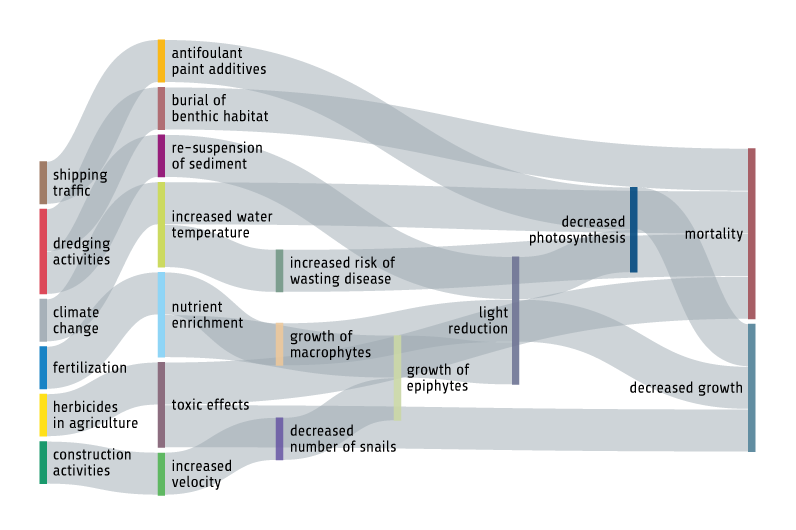 Since species are dependent on each other in the food web, an insufficient environmental status in one part of the ecosystem is expected to also impact other species. 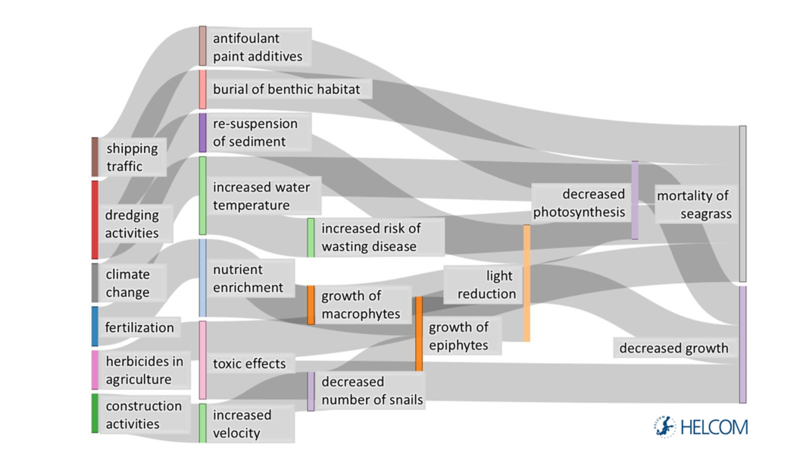 Changes in nutritional status, growth rate or size structure are particularly important indications of changes in the overall functionality of the food web. Further work is required for an indicator-based assessment of food web status in the Baltic Sea. However, available data for some geographic areas and species indicate a decreased nutritional status and size structure in fish (such as Eastern Baltic cod), decreased nutritional status in mammals (such as grey seal) and in some areas a decreased size structure in zooplankton, all pointing towards a deteriorating food web status. Figure ES4. Status of biodiversity core indicators by sub-basin. Green circles indicate good status, red circles indicate not good status. White circles indicate that the core indicator is applicable for the sub-basin, but has not been assessed. Empty points indicate that the indicator is not applicable. For coastal indicators, pie charts show proportion of coastal assessment units per sub-basin in good status (green), not good status (red) and not assessed (white). Figure ES5. Status of commercial fish based on the assessment of fishing mortality and stock size (spawning stock biomass) using data from ICES (2016a). Green circles indicate good status for both these indicators, red circles indicate that at least one of the indicators did not achieve good status. White circles indicate that the assessment is applicable for the sub-basin, but is not yet available. For each species, the lines connect sub-basins which are assessed by the same stock. Empty points indicate that the assessment is not relevant for that sub-basin. Species with no available assessment results are not included. The indicator-based assessments show the status of pressures when assessed individually, without comparing their total impact or how much they overlap with sensitive habitats. The Baltic Sea Impact Index is an assessment component that additionally describes the potential cumulative burden on the environment in different parts of the Baltic Sea. The assessment makes use of more detailed spatial information than can be provided by the core indicators. The results show that the highest potential environmental impacts currently occur in the southwestern Baltic Sea, and that the pressures resulting in most impact on species are concentrations of nutrients and contaminants, non-indigenous species, and the extraction of fish. Other pressures have high influence on specific species and species groups locally, but are less widely distributed. 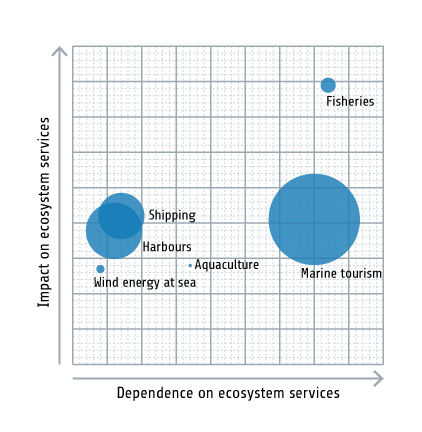 Human activities in the Baltic Sea and its drainage area contribute to pressures that act on the Baltic Sea environment but are also in many cases dependent on a healthy state of the marine environment. 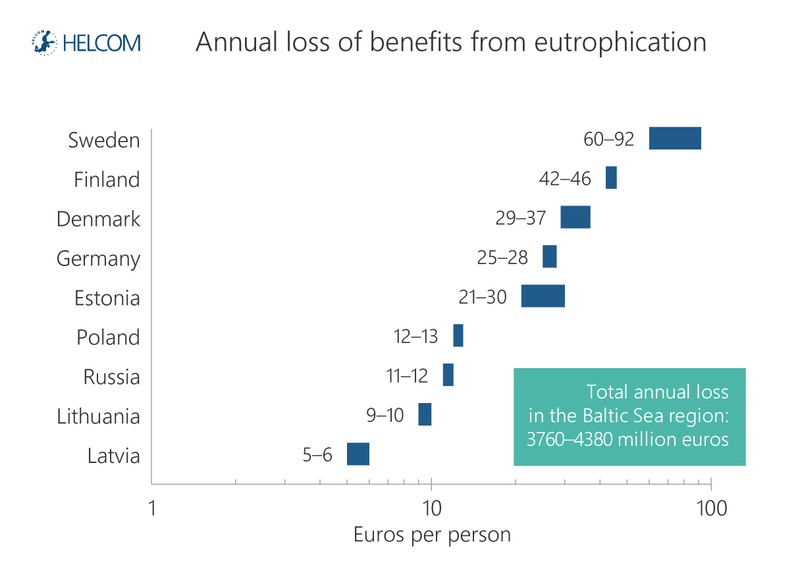 The cost of degradation with respect to eutrophication in the Baltic Sea region is estimated to result in total losses of around 3.8–4.4 billion euros annually. In other words, citizens’ welfare would increase by this much each year if good eutrophication status were achieved. 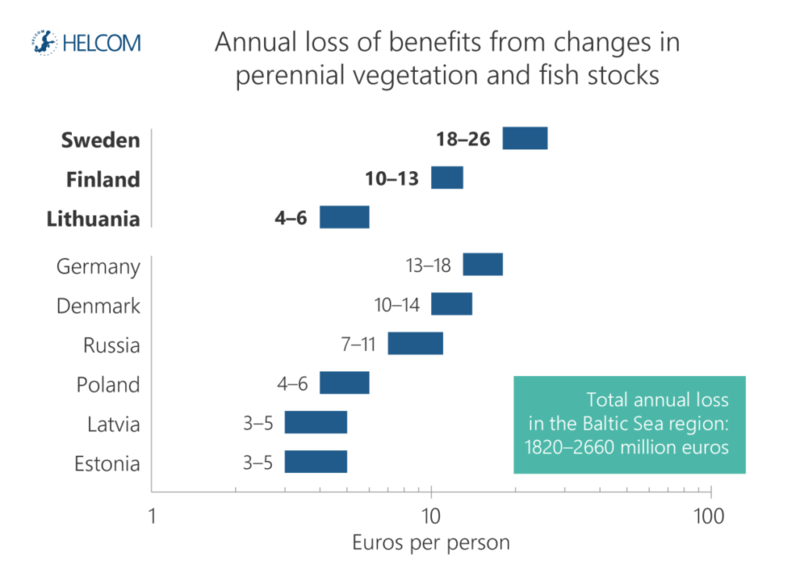 Estimates for selected biodiversity components suggest that citizens’ welfare would increase by 1.8–2.6 billion euros annually in the Baltic Sea region if the state of marine vegetation and fish stocks improved to a good status. 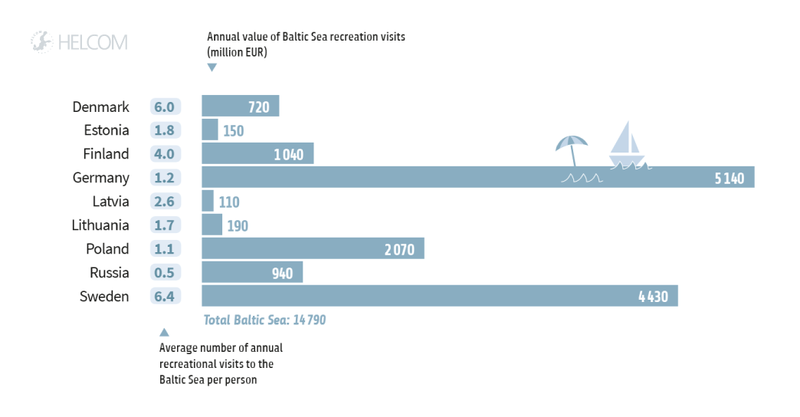 The current recreational benefits of the Baltic Sea are estimated at around 15 billion euros annually. 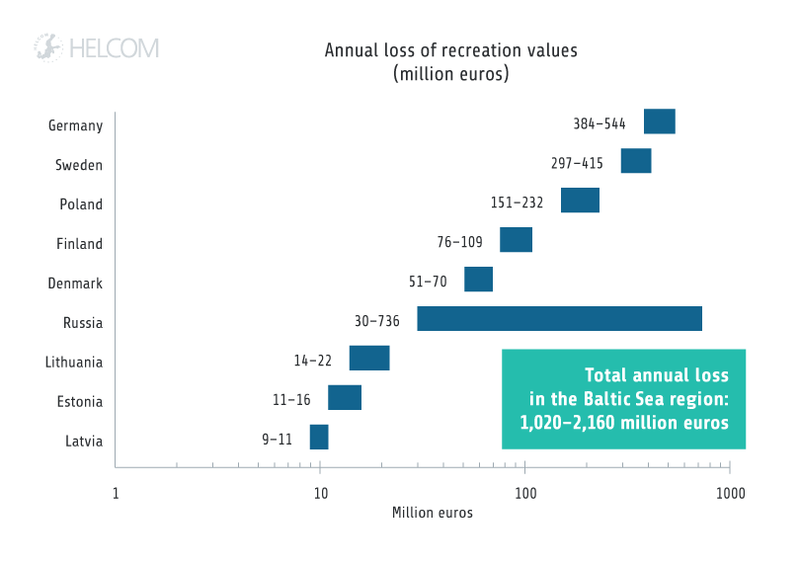 Meanwhile, current loss of recreation values, due to the deterioration of the marine environment, are estimated at around 1–2 billion euros annually.